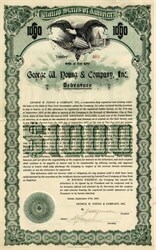 Beautiful certificate from the George W. Young & Company, Inc. issued in 1917. This historic document was printed by the Broun Green Company and has an ornate border around it with a vignette of an eagle holding a shield. This item has the signatures of the Company’s President and Secretary, and is over 93 years old. It is also signed on the back by George W. Young. GEORGE W. YOUNG & CO.
With the growth of New York in financial importance, the field of private banking­already occupied by some of the strongest houses in the monetary world­becomes more and more attractive. Freedom from the restrictions of State and Federal banking laws affords a wider field of operations and greater possibilities of profits, without implying any necessary relaxation of the rules always imposed by considerations of safety. For, primarily, safety in banking is not a matter that can be assured by law. It depends chiefly upon the character of the management. The head of the new private banking firm of Geo. 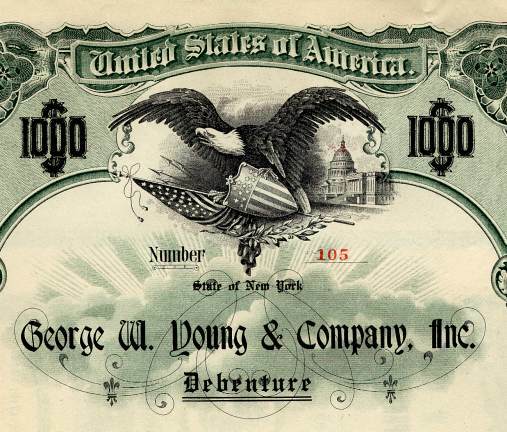 W. Young & Co., New York city, has justly earned a reputation for financial sagacity. His achievements are of a kind entitling him to rank among the most successful bankers of the country. That these are not mere random statements is amply shown by the history of the United States Mortgage and Trust Company, of New York, under his management. From 1893 to the close of 1904, under his direction, the deposits increased from $3,228,658 to $30,269,789, and surplus and profits accumulated to the extent of $4,072,734. During Mr. Young's management the earnings of the company were in excess of $6,250,000; of this amount $2,250,000 was paid in dividends and $4,000,000 added to surplus account. Mr. Young has had such a notably successful business career, that a brief record of it will be found interesting. He was born of Scotch-Irish parentage in Jersey City, on July 1, 1864, and attended the public schools of that city, afterwards taking the evening scientific course at Cooper Union. At the age of thirteen, he entered the employ of the law firm of L. & A. Zabriskie as an office boy, and subsequently, for a time, studied law. Shortly after, he secured a position in the Hudson County Bank, of Jersey City, and when only eighteen was promoted to the position of receiving teller. At this time he successfully passed a competitive examination for a cadetship at West Point, and received his commission from President Arthur; but the death of his father rendered necessary his retaining his position in the bank. When barely past his majority, he became Secretary and Treasurer of the New Jersey Title Guarantee and Trust Company. At twenty-eight he was elected Second Vice-President and Treasurer of the United States Mortgage Company (now United States Mortgage and Trust Company), and at the age of twenty-nine was chosen its President; commanding recognition at once as not only one of the youngest but one of the most able New York leaders in the world of business and finance. The results of his management of this company have been referred to above. Resolved, That we recognize the exellent, energetic and intelligent services which Mr. Young has rendered the company during his incumbency, and we feel that the high position which the company has attained has been in large measure owing to his earnest efforts and untiring devotion. Resolved, That we tender Mr. Young our best wishes for success in the banking firm which he has established." The estimation in which he was held, not only by his official associates but by the employees of the company, was evidenced by the presentation to him of a handsome chiming clock, every one in the service of the company uniting in the testimonial. At a dinner, given by Mr. Young, about one hundred officers and employees were present to express their good will. 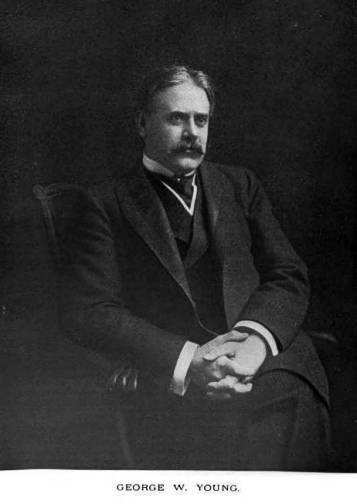 In addition to being so long at the head of the company named, Mr. Young was instrumental in the formation and successful establishment of The Audit Company of New York, Commercial Trust Company of New Jersey, Jersey City Trust Company, Perth Amboy Trust Company and the Windsor Trust Company; and, in addition to being a director in these and in his own company, serves as a director in the following corporations: National Bank of Commerce, Acker, Merrall & Condit Co., Anacostia & Potomac River Railroad Co., Atlantic Securities Co., Bayonne Bank, Brightwood Railway Co., Buffalo Hump Mining Co., Casualty Company of America, City and Suburban Homes Co., City and Suburban Railway Co., Clarksburg Fuel Co., Columbia Railway Co., Continental Investment Co., Eastern Steel Company. Empire State-Idaho Mining & Developing Co., Fairmont Coal Co., Federal Mining ft Smelting Co., Georgetown & Tennallytown Railway Co., Interborough Rapid Transit Co., Lawyers' Surety Co. of N. Y.; Mechanics' Trust Co. of Bayonne; Metropolitan Railway Co., Washington, D. C: N. J. ft Hudson River Railway & Ferry Co., N. Y. Dock Co., Northern N. J. Land Co., O'Rourke Engineering Construction Co., Potomac Electric Power Co., Rapid Transit Subway Construction Co., Registrar & Transfer Co., Somerset Coal Co., Third National Bank, Jersey City, N. J.; Trinity County Gold Mining Co., U. S. Fidelity ft Guaranty Co., U. S. Safe Deposit Co., Washington Investment Co., Washington Railway & Electric Co., Washington ft Rockville Railroad Co., Wolff National Chemical Co.
Mr. Young is a member of the Country Club of Lakewood, Deal Golf, Downtown, Lawyers', Manhattan, Maryland, Metropolitan of Washington, Players', Racquet and Tennis, Riding, and Rockaway Hunting Club. In November, 1889, Mr. Young married Miss Natalie Bray, of Jersey City, and their children are Dorothy and George Washington, Jr. Besides their New York residence, they have a charming summer home, "Oakwood Farm," adjoining the Deal Golf Club at Deal Beach, of which club Mr. Young is President. When Mr. Young established the firm of Geo. W. Young ft Co. he purchased the Stock Exchange seat of Bayard Dominick, Sr., paying $83,000 therefor. It may be regarded as certain, in view of the honorable and successful record already made by Mr. Young, that his firm will become among the strongest and most successful in the city.